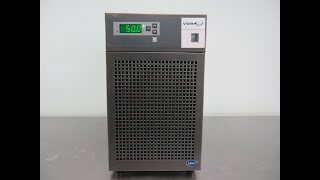 The VWR MM7 Recirculating Chiller provides controlled temperatures in a compact, easy to place instrument for an ideal alternative to tap water chilling. This benchtop immersion water bath has a low maintenance, 14.5 psi centrifugal pump, and an easy to maintain 1/10 hp refrigeration system, with removable filters for easy cleaning. This recirculating chiller has a temperature range of a working range of between -5° to 50°C (23° to 122°F) and has a has a stability of ±0.1° C. The pump of this benchtop chiller features a magnetic drive that’s easy to control from the up front, bright digital display letting users quickly and easily set their parameters including alarms set points, and reports back actual temperature and fluid level. This VWR MM7 Recirculating Chiller has been fully inspected and is performing to expectations. Please note this unit does have a small dent in the rear of the housing it is however cosmetic and does not affect performance. All of our lab equipment comes backed with our standard warranty. Should you have any questions, please don't hesitate to contact us.